Artificial turf is a synthetic surface that imitates natural grass for landscaping and athletic purposes. The primary use of artificial turf is in arenas for sports such as football and soccer yet is also used for landscaping with both commercial and residential applications. Artificial turf was first introduced in 1966 when it was used in the construction of the Astrodome and has allowed for new possibilities in the fields of architecture and landscaping. Artificial turf, at first glance, is not usually recognized for its complexity yet the extensive process results in an amazingly advanced alternative to natural grass. It is made of a great array of materials which gives the consumers various options regarding the turf. The materials used in the complete production of artificial turf can be categorized into sections of raw acquisition, manufacturing, distribution, maintenance, and recycling. These factors and categories of materials lend to the fascinating process of making artificial turf and have allowed it to become the versatile product that it is today. The major benefit to artificial turf and the reason that it is such a staple item in society is due to the fact that it requires far less maintenance compared to natural grass. Artificial turf is made of a relatively few amount of raw materials compared to many other products which allows it to be produced at a very high rate. The artificial turf is composed of three general parts: the synthetic grass fibers, the backing structure, and the rubber infill. This takes more than just finding the raw materials because “the quality of the raw materials is crucial to the performance of turf systems” (NYC Health, 2012). In regards to the synthetic grass fibers, there are two options: nylon or polypropylene. The more common of the two materials is nylon, a petroleum based polymer, because despite it being a bit more expensive than polypropylene, it performs better in the categories of strength, resilience, UV resistance, abrasion resistance, color retention, and water resistance (Zeager, 2017). The next section of artificial turf is known as the backing surface which is a urethane foam sheet that is either perforated or non-perforated. This subject is explained in a 2011 article by the Synthetic Grass Warehouse which states that “most secondary backings of contemporary synthetic grass are made of urethane and feature perforations, or punched holes every couple of inches” resulting in a faster drainage system. The only disadvantage to a perforated urethane backing is that it is more susceptible to weed growth than a non-perforated sheet yet this can be counteracted by a sand and gravel foundation which will be later addressed. The final raw material that must be acquired in order to create artificial turf is crumb rubber infill which shall be derived from used whole vulcanized automobile, SUV, and truck tires, as explained in the article, “Guidelines for Crumb Rubber Infill Used in Synthetic Turf Fields”, by the Synthetic Turf Council in October 2014. These materials are accessible and often from recycled products which helps to alleviate the impact that artificial turf may have on the environment. This is supported by ScienceDirect in an article by Xiaolin Li which states that crumb rubber material is prepared by shredding tires and other sources of used rubber as an attempt to recycle these wastes. It also states that as of 2008, there are 3500 full-size artificial fields in the US with 900–1000 new fields being installed annually which shows how successful this recycling process converts waste to a new field or lawn. The manufacturing process of artificial turf is a vital aspect in its material life cycle. Alike the raw materials discussed above, the manufacturing process is not large in quantity yet again the quality is crucial to the success of the artificial turf (Made How, 2015). In this stage a few more materials are introduced into the equation to carry out the manufacturing process and get the turf ready for distribution. This process begins with nylon pellets being mixed in a massive drum with added dyes and chemical stabilizers. These ingredients are mixed with varying temperatures until the mixture reaches a thick, taffy-like consistency. This substance is then extruded into long thin strands that resemble the shape of natural grass, to which they are then fed through a tufting machine. This is then stitched into a thin nylon mesh fabric with the use of several hundred needles which allows for several hundred rows of stitches to be carried out per minute. Once the upper layer of turf is complete, the underside is covered in a latex adhesive and then rolled onto the urethane foam backing (Made How). After being cured by heat and tested for strength and appearance, the artificial turf is ready for packaging and distribution. The rubber infill is made separately and does not come into contact with the grass surface until it is installed. This infill is made of recycled tires which have been retired and would have otherwise ended up in landfills (Eco-Healthy Child Care, 2017). In this aspect of the artificial turf, reusing the recycled tires helps reduce the harmful emissions which would have been released into the atmosphere if the tires were burned in a landfill. Although this process may seem quite time consuming, it is much faster than the alternative—watching grass grow. Now as the distribution stage comes along, the artificial turf is packaged and transported to either wholesalers or directly to the consumer. This is most commonly done by freight train considering that the massive rolls of artificial turf are extremely heavy and large for plane or long distance automobile transport. When shipped internationally, the rolls of artificial turf travel by cargo ship where the shipping containers can be transferred from train to ship and vice versa. The material packaging for artificial turf usually includes a paper sheet inside the roll to prevent the product from becoming deformed in transport and a large plastic wrapping which encloses the entire roll. This process is very efficient considering the rolls of turf are compact and uniform in shape which allows for space to be maximized in the shipping containers. The installation of artificial turf is quite simple yet it does introduce new materials which allow for the best results of the product. This includes a sand and gravel mixture which offers the best support and reliability as the foundation on top of the pre-existing dirt because dirt is expansive and allows weeds to grow under the artificial turf (PurchaseGreen, 2018). The turf is then laid down in its final position before the rubber infill is poured. The rubber pellets naturally fall between the blades but this process can be accelerated by raking and smoothing over the turf by hand. Some concerns have been brought up regarding health risks of crumb rubber and even the blades of artificial turf. In response, several studies have been conducted regarding the toxicity of these materials, such as research done by the Consumer Product Safety Commission and the Agency for Toxic Substances in 2008 and 2009, which concluded that any potential releases of toxic chemicals are below levels of concern (Environment Protection Agency, 2018). After the turf has been installed, maintenance becomes the focus. The maintenance required for artificial turf is extremely minimal compared to real grass in which you have to ensure proper sunlight intake, water, cut, reseed, fertilize, and remove weeds. With artificial turf, all that is needed is a monthly raking to remove dust, debris, and other objects from the turf. This not only saves time for the owner of the turf and money on natural lawn maintenance but it also is a more sustainable option in most situations. Artificial turf replicates natural grass in nearly every way and has characteristics which allow for new architectural and landscaping possibilities. Through the entire life cycle of artificial turf, many materials are used yet they are integrated with great efficiency and quality which allows the finished product to perform with such great success. Natural grass is time consuming to acquire and maintain and far less sustainable than artificial turf which saves water and nearly eliminates waste and maintenance. Artificial turf “can be used quickly after installation, usually within a few days, rather than the weeks it takes for a sod to become robust enough for use” (Simon, 2010). It also has the capabilities of being “used in snow, and in general is not affected by precipitation due to the drainage system involved” (Simon, 2010). Artificial turf and its benefits are often overlooked yet it has allowed for new avenues and possibilities that natural grass was unable to achieve. This revolutionary technology has solved problems regarding water conservation and several other pressing issues that arise with the requirements of natural grass. With the advances that artificial turf has experienced and continues to undergo, there is no telling the limits to which it will improve modern society. 1. Li, Xiaolin. “Characterization of substances released from crumb rubber material used on artificial turf fields.” ScienceDirect, Elsevier BV, 21 Apr. 2018, https://www.sciencedirect.com/science/article/pii/S0045653510004285. 2. “Artificial Turf.” How Products are Made, Made How, 2015, http://www.madehow.com/Volume-7/Artificial-Turf.html. 3. “Six Components and Materials to Consider for Your Artificial Grass Installation.” PurchaseGreen, 9 May, 2018, https://www.purchasegreen.com/blog/six-components-and-materials-to-consider-for-your-artificial-grass-installation/. 4. “Guidelines for Crumb Rubber Infill Used in Synthetic Turf Fields.” Synthetic Turf Council, 24 Oct. 2014, https://cdn.ymaws.com/www.syntheticturfcouncil.org/resource/resmgr/guidelines/STC_Guidelines_for_Crumb_Rub.pdf. 5. “Crumb Rubber & Artificial Turf.” Children’s Environmental Health Network, Eco-Healthy Child Care, Dec 2017, https://cehn.org/wp-content/uploads/2017/12/Crumb-Rubber-and-Artificial-Turf_Dec2017.pdf. 6. Simon, Rachel. “Review of the Impacts of Crumb Rubber in Artificial Turf Applications.” University of California, Berkeley, Manex, 1 Feb. 2010, https://escholarship.org/uc/item/9zp430wp. 7. “Federal Research on Recycled Tire Crumb Used on Playing Fields.” EPA, Environmental Protection Agency, 14 Sept. 2018, www.epa.gov/chemical-research/federal-research-recycled-tire-crumb-used-playing-fields. 8. “Artificial (Synthetic) Turf.” NYC Health, 29 Aug. 2012, https://www1.nyc.gov/site/doh/health/health-topics/artificial-turf.page. 9. “Nylon vs. Polypropylene in Synthetic Turf.” Zeager, 13 Feb. 2017, www.zeager.com/recreation/nylon-vs-polypropylene-synthetic-turf/. 10. SGW. “Turf Backings - What You Need to Know.” Synthetic Grass Warehouse, SGW, 1 Nov. 2011, https://syntheticgrasswarehouse.com/turf-undercover-talking-points-for-backings/. Artificial turf first gained attention in 1966 when it made its debut in the Houston Astrodome. Since then artificial turf has increased immensely in popularity and has found its way onto high school fields and suburban front lawns alike. The artificial turf of today is composed of synthetic grass blades attached to a rubber mat with either rubber crumb or shorter blades for support and structure. The complete production process and life cycle of artificial turf entails gathering raw materials, manufacturing the synthetics, creating the final product, and recycling or refurbishing the used product. Although Artificial Turf is a simple product, the production process is anything but, with extensive energy usage involved in the manufacturing, installment, and removal of artificial turf. To begin, we will look into the complexities of manufacturing artificial turf starting from the origin of its production. Most artificial grass blades are made of polyethylene and/or polypropylene: the two most common plastics in production today. The raw materials used to create these plastics are Petroleum and Natural Gas. Thus, the embodied energy of Artificial turf includes the energy used in the acquisition and processing of these materials. Petroleum and natural gas extraction requires drilling a well, lining the well with concrete, perforating the concrete, and then separating the combination of oil, gas, and water that arises. This process is energy intensive requiring heavy machinery which, depending on the machine, can be powered by an electric motor or internal combustion engine. The chemical process used to refine petroleum and process natural gas produces products and byproducts such as ethane and propene, key ingredients in the production of the aforementioned polyethylene and polypropylene. Once these plastics are produced, they are shipped to manufacturers in the form of pellets. These plastic pellets are the secondary raw materials that are received by manufacturers of natural grass such as TigerTurf and Everlast Artificial Grass. The pellets must then be melted down and extruded, or pulled into strands. These plastic strands are then twisted into a yarn that will be used as the grass blades. The yarn is then tufted or needle-punched into the backing, and cut to the desired length. The reverse side of the backing is then coated in latex or polyurethane to keep the tufts in place and provide overall stability. Drainage holes are then pierced and and the completed turf is cut to length and rolled for use. This manufacturing process is done with machines that primarily use electric motors. One “Artificial Grass Matt Making Machine” uses 340kW per hour. This specific machine takes the yarn and sews it onto the backing. As there are several more steps in the manufacturing process several other machines of comparable magnitude will most likely be needed. Once the final product is created there is an immense embodied energy stemming from, petroleum and natural gas refinement, plastic production, and electricity used to in the manufacturing process. The second step in the life cycle of Artificial Turf is installation; which proves to be a labor and energy intensive process. A full Artificial Turf System requires several layers of material for proper draining and levelness. A layer of soil and/or grass must be removed depending on how many and what types of layers will be implemented in the system. Typically anywhere from 2 to 10 inches need to removed so that the artificial turf will be even with the surrounding area once all other layers are in place. The most typical layers include a geotextile to keep weeds from growing, 3/4 inch size crushed stone, and class II road base. Some optional layers are rodent wire to keep rodents from chewing through the turf, and rubber padding if the field will be used for sports or recreation. After the turf is installed over this base, rubber crumb infill is typically added to provide extra structure and support to the grass. The installation process requires some machinery depending on the scale of the project. For smaller home projects most work can be done by hand but it is helpful to use machines such as a rototiller and a plate compactor. Both of these machines are gasoline powered and need to be manually operated. For larger projects such as a sports field, heavy machinery is used to remove soil, move material, level the base, lay the turf, and apply the infill. These machines are typically gasoline powered via an internal combustion engine or have an electric motor. The man hours and machine power all add to the overall embodied energy of the artificial turf as it is a necessary step before it can be used. This also includes transportation of materials to the site whether domestic by motor vehicle or foreign by ship. Following installment there are two more major steps left in the lifecycle of the product. Once artificial turf is installed, there is relatively little that happens for the next 15 to 20 years. Unlike many other products artificial turf does not require operational energy once it is being used, meaning that very little embodied energy will be added into the life cycle in this phase. Throughout the duration of its usage, maintenance is recommended about once a month. Maintenance is mostly optional and includes: brushing the grass to raise the blades and spread infill, spraying with water to remove dust or pollen, and raking to remove larger debris. All of these tasks can be done manually, adding little embodied energy to the grass’s lifecycle. Artificial turf typically comes with a 10-15 year warranty so we can assume that most turf products should last through this period if not longer. It is in the usage step that artificial turf saves more energy than natural grass due to the fact that it does not need to be mowed and it requires little to no watering. However, when artificial grass is added to areas that were previously not covered with natural grass these advantages are not applicable. Once the artificial grass is worn out we move onto the next step. The final energy intensive step in the life cycle of artificial turf is the removal, recycling and reuse process. Turf removal is accomplished either by hand or via turf removal machines that are capable of picking up, removing infill, rolling the turf, and cutting it. Depending on the proximity of the removal site to a recycling center, the remover will decide whether to recycle or dispose of the turf. If it is not economically efficient to transport artificial turf to the nearest recycling plant, it will most likely be taken to a landfill where its life cycle will end. If the turf is sent to a recycling plant the tufts must be removed from the backing in order to be melted down for reuse of the plastic. Another process done by the plant is incineration which is used to produce energy. The other materials used in an artificial turf system can also be recycled such as the rubber infill and rubber padding layer. This means that in recycling artificial turf, energy is: saved by reusing material, produced via incineration, but also used throughout the entire process. A third option for used turf is simply, reuse. Although reuse seems positive in theory, most reused turf will likely end up in a landfill as households or individuals usually do not have the time or energy to take relatively small amounts of turf to the nearest recycling plant. Thus, artificial turf will either be recycled, destroyed, or find its way into a landfill. The life cycle of artificial turf is a long and complicated process that in the end creates a product with massive amounts of embodied energy. This energy comes from raw material extraction, processing, manufacturing, transportation, installation, maintenance, and recycling. As this is the end of the process, it is possible that it might just start all over again. As the use of artificial turf is an economic and aesthetic decision, many turf fields and lawns that are removed will only be replaced by another newer turf field. Especially because the literal groundwork is already in place. It seems as though the cycle will continue on and that artificial turf is here to stay. Although this paper only covers up to the point until artificial turf is recycled or reaches a landfill, the life cycle arguably does not end there. The plastic created to produce the artificial turf will take enormous amounts of time to break down and even then will only become smaller and smaller pieces of plastic and toxic chemicals. In other words artificial turf and its harmful effects on the environment will last much longer than those who created it. Artificial turf was created to have the cost benefits of a low maintenance field however, the future repercussions may outweigh these benefits if artificial turf does not undergo a change for the better. “800.464.0477.” Turf Sports: The History of American Football | Articles | TigerTurf, tigerturf.com/us/about/glossary. Factors Affecting Gasoline Prices - Energy Explained, Your Guide To Understanding Energy - Energy Information Administration, www.eia.gov/energyexplained/index.php?page=natural_gas_home. Removal, Recovery, Reuse and Recycling of Synthetic Turf and Its System Components. Synthetic Turf Council, 2015, www.syntheticturfcouncil.org. Research & Latest Thinking - Synthetic Turf Council, www.syntheticturfcouncil.org/page/Glossary. “Artificial Grass Installation | How to Install Artificial Grass | Turf.” Genesis Turf, www.online-turf.com/artifical-turf-diy/. “Artificial Grass Mat Making Machine - Buy Artificial Grass Mat,Artificial Grass Extruding Line,Artificial Marble Production Line Product on Alibaba.com.” Www.alibaba.com, www.alibaba.com/product-detail/Artificial-Grass-Mat-Making-Machine_60766804978.html?spm=a2700.details.maylikever.12.23532e4dBlGoOG. “Artificial Turf.” Artificial Turf in Jacsksonville Florida, landimpressions.com/artificial-turf/. “Artificialgrassdubai.” Artificial Grass Dubai, www.artificialgrassdubai.ae/artificial-grass-installation/. Bearden, John H. "Apparatus for collecting artificial turf for recycling." U.S. Patent No. 8,464,801. 18 Jun. 2013. “Commercial Synthetic Grass Installation Process.” Always Green Synthetic Grass, alwaysgreensyntheticgrass.com/commercial-synthetic-grass-installation/. “Ethane.” Wikipedia, Wikimedia Foundation, 24 Nov. 2018, en.wikipedia.org/wiki/Ethane. “Ethylene.” Wikipedia, Wikimedia Foundation, 22 Nov. 2018, en.wikipedia.org/wiki/Ethylene. “Petroleum - Oil and Natural Gas | energy4me.” energy4me What Is Energy Comments, energy4me.org/all-about-energy/what-is-energy/energy-sources/petroleum/. “Petroleum Refining Processes.” Wikipedia, Wikimedia Foundation, 2 Dec. 2018, en.wikipedia.org/wiki/Petroleum_refining_processes#The_crude_oil_distillation_unit. “Polyethylene.” Wikipedia, Wikimedia Foundation, 29 Nov. 2018, en.wikipedia.org/wiki/Polyethylene. “Polypropylene.” Wikipedia, Wikimedia Foundation, 4 Nov. 2018, en.wikipedia.org/wiki/Polypropylene. “Propene.” Wikipedia, Wikimedia Foundation, 26 Oct. 2018, en.wikipedia.org/wiki/Propene. Artificial turf, also known as turf, has been a very convenient substitute for natural grass amongst many sports fields and homes. It offers the same looks, performance, and feel of natural grass without the extra work in maintenance and is generally more cost effective in the long run. In most cases, one could not immediately tell the difference between natural grass and artificial grass upon first glance without closer observation. With most artificial substitutions however, there are generally questions regarding the emissions and environmental effects from its production. While there are many positive aspects to artificial grass such as durability, ease in maintenance, and use of recycled materials, the amounts of waste and emissions produced from the process of manufacturing, shipping, and upkeep can cancel out its positive effects. Artificial grass has many positive environmental effects but ultimately its composition of plastic and rubber contributes a large amount of environmental waste. The compositional layers of artificial grass mimic ones of natural grass. Natural grass consists of grass on top, surface soil and subsoil, and then parent rock and bedrock at the very bottom. Artificial grass has plastic fiber blades that parallel those of grass blades, then the infill and stone take place of the soil, and at the bottom are generally pipes and compacted soil to serve as a drainage system which exist in natural grass organically. The construction of the artificial grass fibers consists of either polyethylene, nylon, or a combination of both of the two materials (Cheng, 2114). The raw material in the artificial grass fibers are from synthetic granules of polyethylene and these granules are made from natural gases such as ethane that go through a process called “cracking” to convert it into ethylene. During the extraction period, small leaks through the gas pipe could lead to inhalation of the gas which is considered a carcinogen by the International Agency for Research on Cancer (SEPA). In addition, the process of retrieving the fuel itself, called “fracking,” is detrimental to the environment because of the release of methane into the water (Nilsson). The hydraulic pressure used to obtain ethane allows harmful gases to pollute the water in the area. This is just one aspect in production of the artificial grass used in the plastic grass blades and there already exist traces of waste and emissions that affect our environment. Another aspect of environmental waste and emissions come from the manufacturing processes and formulation. The main component in artificial grass would be the rubber infill that supports the plastic blades of grass. One of the large claims regarding the environmental benefits of artificial grass would be the recycling of tire rubber. However, the emissions produced from the mechanical disintegration of scrap tire rubber have environmental impacts that often go overlooked (Cheng, 2116). Tire rubber generally contain chemical vulcanizers, oil-based plasticizers, antioxidants, and antiozonants (Rosenblatt). The organic compounds in addition to the heavy metals in the rubber can be slowly released through a process called volatilization or leaching, under natural conditions and contaminate the air and water around it (Moretto). A chemical analysis of the surrounding air of an artificial turf field indicated a variety of air pollutants such as aliphatics (octane, decane, undecane), aromatics (benzene), polycyclic aromatic hydrocarbons (PAHs), methyl isobutyl ketone, and benzothiazole (Cheng, 2117). Benzothiazole became the most abundant pollutant and remained dominant long after the studies and observations. These contaminants became apparent through the shredding and grinding of the rubber tire to create the infill and the polymer decomposition. Whereas one can walk onto a grassy field and feel content, calm and relaxed with the smells of nature, unbeknownst to many, walking onto a turf field comes with the inhalation of toxic and hazardous fumes that shouldn’t be absorbed into one’s system. Artificial fields have a larger carbon footprint than natural grass fields. A majority of this has to deal with its production, construction, and maintenance transportation as a majority of the parts and components of artificial grass are made overseas with the addition of transportation for disposal (WA Government). The vehicles would transport supplies and materials such as pipes, mats, adhesives, quarry materials, infills, and paint (Magnusson). Data from vehicle emissions revealed that over 2,200 km of transportation is required per production batch (Magnusson). Most of the transportation sources are boats and medium sized trucks which generally emit lots of CO2 gases over long distances. In addition to this, the transportation to disposal sites and junk yards make synthetic fields much more detrimental to the environment and atmosphere. In a timeline of 10 years, transportation processes artificial grass fields release greenhouse gas amounts of approximately 16.4 tons CO2; this is a dramatic difference from the transportation costs of natural grass being only 0.8 tons CO2 (Meil, 8). When examining transportation and distribution data, artificial grass fields are not beneficial to the environment in this aspect. A highlight of artificial grass fields includes the ease in maintenance and prolonged use as opposed to natural grass fields. Artificial grass fields can last in many weather conditions, require less water to maintain, and a lot more durable than natural fields (Adachi). Synthetic grass requires about 4 tons of CO2 to maintain in a span of 10 years; this figure is much lower compared to natural grass because it doesn’t require cutting/trimming and irrigation (Meil, 8). Most of the maintenance of artificial fields include brushing, harrowing, plowing, and salting the fields for upkeep (Magnusson). There is a drainage and irrigation system set into place on the bottom layer of the artificial grass and this prevents further damage to the field and stabilizes the field’s quality. Despite the improvements in water consumption, the materials required to construct the drain system and upkeep does still add onto environmental impacts. The recycling process of the synthetic fields is crucial to maintaining a good environmental standing. Synthetic fields are supposedly 100% recyclable, and this is important in minimizing environmental impacts because of all the crumb rubber in the infill. A positive aspect to recycling the rubber infill from artificial grass is that there are greenhouse emissions savings to it if done correctly; in a span of 10 years, recycling the rubber infill can help remove 52.6 tons of CO2 in the atmosphere, so in the long run, synthetic fields definitely do have some positive environmental effects. When artificial grass isn’t recycled and disposed of properly, it creates a huge toll on harming the environment. Improper disposal such as dumping it into landfill or burning it will emit copious amounts of greenhouse gases into the atmosphere such as dioxins and the chlorine found in the rubber (Cheng, 2124). The synthetic fields may also not be able to be tossed into landfill as rubber is banned in certain areas from disposal sites because of its toxicity when degenerating over time (Cheng, 2124). It isn’t biodegradable and properly disposing the material does take a large amount of energy and costs. The plastic, additionally, must be separated to be disposed of according to the material it is based on since the plastic blades consists of polyethylene, nylon, and rubber. The costs of shipping and transporting these products for disposal and separating them adds onto the emission amounts and costs (Alm). Because of this, proposals for reusing and recycling this product is generally preferred than disposal of it. Throughout the study, there was an abundance of information regarding the amounts of greenhouse gases and wastes from artificial grass. A key component that lacked research would be the direct association and contact with the production of it. There aren’t many studies about factories and worker conditions in its production and this could provide more key details towards the overall effects of artificial grass. Additionally, there were only generic resource details about waste management about artificial grass overall since most of the studies focused more on the rubber infill that part of it is composed of. Through a life cycle analysis of the waste and emissions of artificial grass, it can be concluded that there are many harmful effects done to the environment throughout the production, distribution, maintenance, use, and disposal of it. While there are some case studies that additionally analyze the life cycles of artificial grass, there was a lot of data emitted in their final data summaries due to lack of funding and access to facilities and information. The general consensus, however, is that there are pros and cons to both natural and artificial grass fields, but overall the emission of greenhouse gases from the rubber infill and the difficulty in disposal have a negative impact on Earth’s environment despite the positive effects it has in different areas. “Ethylene.” Scottish pollutant release inventory. Scottish Environment Protection Agency (SEPA). http://apps.sepa.org.uk/spripa/Pages/SubstanceInformation.aspx?pid=54. “Natural Grass vs Synthetic Turf Study Report.” Edited by WA Government, Broader Environmental Considerations, Department of Local Government, Sport, and Cultural Industries, www.dsr.wa.gov.au/support-and-advice/facility-management/developing-facilities/natural-grass-vs-synthetic-turf-study-report/broader-environmental-considerations. Adachi, Jennifer, et al. Comparison of the Lifetime Costs and Water Footprint of Sod and Artificial Turf: A Life Cycle Analysis. 2016, Comparison of the Lifetime Costs and Water Footprint of Sod and Artificial Turf: A Life Cycle Analysis. Alm, Abigail. “Is Synthetic Turf Really “Greener”? A Lifecycle Analysis of Sports Fields Across the United States” Carthage College. 2016. Cheng, Hefa, Yuanan Hu, and Martin Reinhard. "Environmental and health impacts of artificial turf: a review." Environmental science & technology48.4 (2014): 2114-2129. Magnusson, Simon, and Josef Mácsik. "Analysis of energy use and emissions of greenhouse gases, metals and organic substances from construction materials used for artificial turf." Resources, Conservation and Recycling 122 (2017): 362-372. Meil, Jamie, and Lindita Bushi. 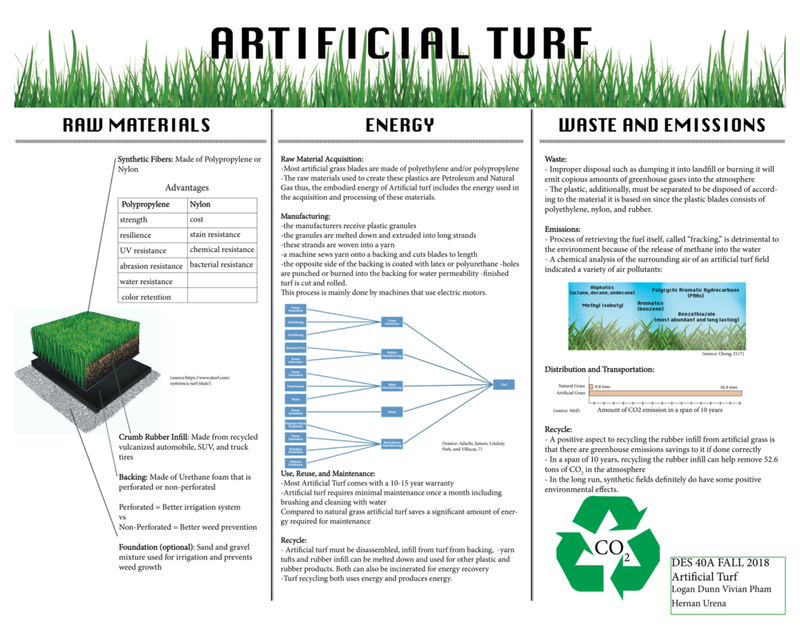 "Estimating the Required Global Warming Offsets to Achieve a Carbon Neutral Synthetic Field Turf System Installation." Athena Institute: Ontario, Canada (2007). Moretto, Robert. "Environmental and health assessment of the use of elastomer granulates (virgin and from used tyres) as filling in third-generation artificial turf." EEDEMS (Ademe, Aliapur, Fieldturf Tarkett (2007). Nilsson, Nils H., et al. Mapping, emissions and environmental and health assessment of chemical substances in artificial turf. Copenhagen, Denmark: Danish Environmental Protection Agency, 2008. Rosenblatt, Mathew. “To Educate The Public on Negative Aspects of Synthetic Turf Sports Fields.” Synthetic Turf Disposal and Health Concerns. Rutgers University. (2010). Sullivan, Joseph P. “An Assessment of Environmental Toxicity and Potential Contamination from Artificial Turf Using Shredded or Crumb Rubber.” Scrap Tire Final Report, Ardea Consulting, Mar. 2006, www.ardeaconsulting.com/pdf/Assessment_Environmental_ Toxicity_ Report.pdf.